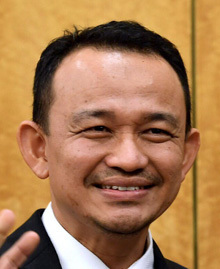 KUALA LUMPUR: Education Minister Dr Maszlee Malik today announced the new repayment scheme for National Higher Education Fund Corporation (PTPTN) borrowers has been postponed. On Wednesday, PTPTN announced that Scheduled Salary Deductions (PGB) would begin in January for borrowers earning from RM2,000 a month. Under the PGB, borrowers earning between RM2,000-RM2,499.99 must pay two per cent (between RM40 and RM49.99) and those earning RM2,500 to RM2,999.99 pay three per cent (RM75-RM89.99). Borrowers earning RM3,000-RM3,999.99 have to pay five per cent (RM150-RM199.99); RM4,000-RM5,999.99 eight per cent (RM320-RM479.99); RM6,000-RM7,999.99 pay 10 per cent (RM600-RM799.99) and those earning RM8,000 and more have to pay 15 per cent (RM1,200 and above). The PTPTN announcement met with reactions from many parties, including politicians, who wanted the scheme to be reconsidered so as not to burden borrowers.